Homemade Enchilada Sauce for .87?! Mexican food is a lot easier to make yourself than people realize. Sauces and condiments are even easier. All it takes is the usual suspects like onions, peppers, garlic, mixed with additional ingredients that make it unique, and patience. I’m the kind of gal that refuses to get basic dishes at a restaurant because with a little effort, I can make it myself. Yes, I’m a picky restaurant eater 🙂 that is when the opportunity arises. The one thing I love about any Spanish food in general especially favorites is that almost all of the ingredients or at least major ones you can grow yourself. My garden this year failed miserably yet again! If I can’t grow my own, I buy bulk when in season and I can it. But besides seasonings, this type of cuisine is extremely frugal because it uses a ton of fresh produce. This is also a fantastic pantry meal. First, soak your dried peppers if you opted for dried for at least 30 minutes. If you used fresh you can either blister them over a flame or grill or simply roast them in the oven. A little trick I learned is that this original recipe called for using a cup of the water that you soaked the peppers in. This liquid can be very bitter giving you the typical canned enchilada sauce flavor. Replace this liquid in cooking with a bottle of good beer! I used Shiner Boch. I don’t care for blonde or pale beer so I used an amber beer, but any will work. Sauce the garlic in olive oil and add onions. Sweat your onions until soft. Sweating means your not browning the onions just making them soft. Add 1 cup of beer and drink the rest 🙂 tomatoes, and brown sugar and simmer for 10 minutes. Add the soaked peppers which have the stems and seeds removed along with all of the other ingredients and bring to a boil for another 25 minutes until slightly thickened and reduced. I love heat so I kept all of the seeds. You can tweak this recipe anyway you want depending on your taste. If its too sweet for you, you can add more acidity and red pepper flake. I ended up adding another tablespoon of salt. If this is too thin you can puree it in a blender or food processor. Leave 1 inch head space in your jars and process in a pressure canner for 50 minutes. For very basic information on canning click here. Total Cost: Under $7 for me as I had most on hand in bulk. For 8 pint jars it is about .87 which is much cheaper than a can in the store. My family of 3 uses one pint per meal. I’ve done a ton of canning, cooking, and freezer meals over the summer and am posting slowly 😯. Time always gets away from me. Summer was a blast, my boy’s back in school, and soccer and football are just starting. But aside from all of that I’ve been building up our pantry and food supply. I’m at about 93 jars of canned food including broths, jams, pickles, sauces, beans, butters, veggies, and raw packed meat. 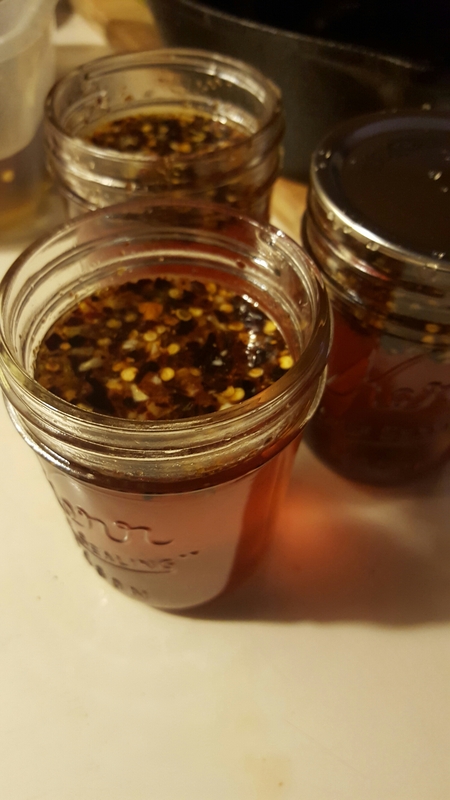 One of my favorite recipes lately is a sweet thai chili sauce. Anyone who knows me knows I can’t resist two things. Sushi and Chinese food. Recently, we’ve been playing around with various recipes and this one is amazing! In a large pot combine all ingredients and bring to a boil. Boil for 5 minutes until slightly thickened. That’s it! If you want it thicker, I’ve heard of some people using Clear Gel. I kept this as is and it’s fantastic. I marinate chicken with it and use it in stir frys. To can this, process in a water bath canner or large pot for 20 minutes. 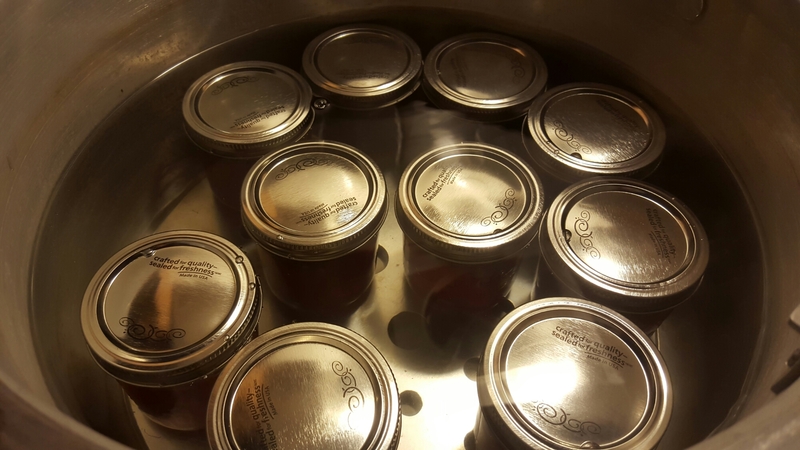 Be sure to cover your jars with water 1 inch above the lids. This by far is so much cheaper making it yourself than to buy in the store. On average it would cost about $3 to buy pre-made. I estimated that this recipe costs about $4 for 15 pints. Happy Sunday! Babydoll leaves out this afternoon so today’s my cleaning day. My garden is looking super sad but it’s surprising me. We planted mid February which was a mistake because we had two frosts and what felt like a typhoon of rain. I wrote about our rain issue in a previous garden update. I lost almost everything. A week or so ago I realized, maybe not! We’ve had really great weather which probably helped. 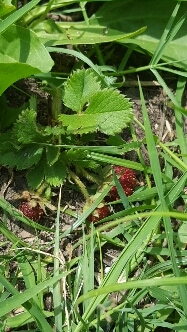 My strawberries keep growing the berries but the plants are the same size as they were in February. 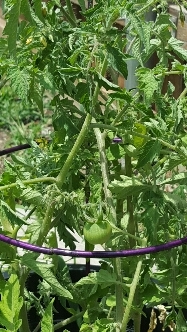 “I think” this is my cherry tomato plant which shocked me when I first saw it. It’s blooming with flowers and 4 tomatoes. 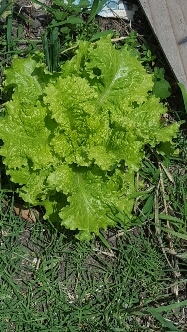 Cabbage mystery! I don’t know where this came from, but I did plant some last year. Hmmmm. 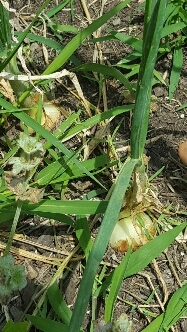 I have 7 onions which made it through the floods lol. They are about tennis ball size if not a little smaller. Yay! Despite my gardening failures, I’m pretty happy. 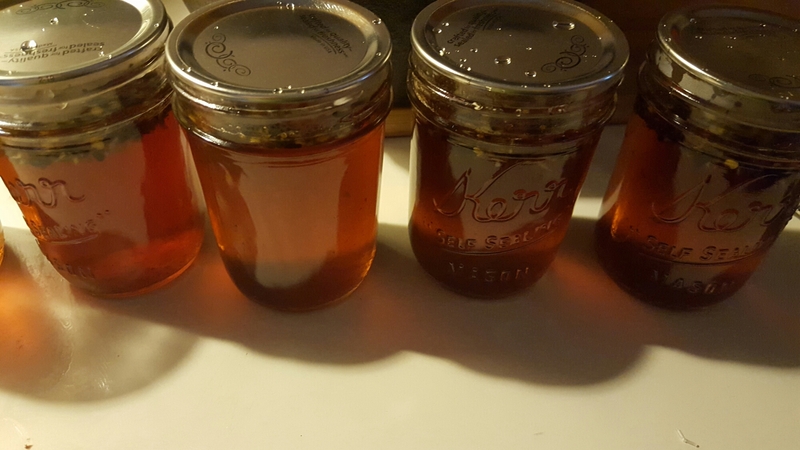 I even got some canning done. 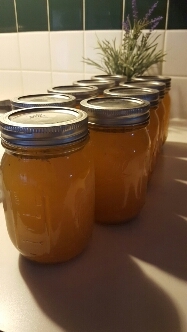 I made more chicken stock because my last batch was made in January and I’m already out. 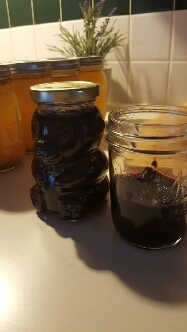 I had some sweet potatoes and leftover blackberries too so I canned the potatoes and made blackberry preserves. 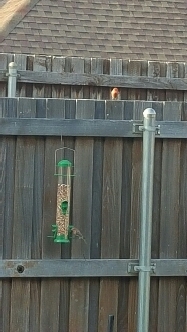 Now I’m relaxing on my patio watching in amazement the conversation happening from every rooftop near me and on my fence. Haha! What is everyone else up too on this beautiful Sunday? North Dallas is gorgeous and sunny 82 degrees. Happy Monday! Boy do I have achy feetsies today. 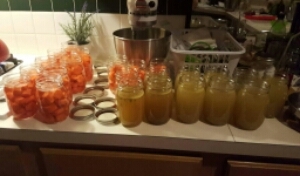 My feet hurt from all of the canning I did yesterday, but it was so worth it. I ended up getting three more flats of pint jars during my run to Winco along with bulk spices, bulk veggies, and beef marrow bones. I just felt like canning. Ever get the urge to just cook? LOL! Plus, this will bulk up our pantry with common staples I can use for anything. I’ve decided to keep almost all of my savory foods a little on the blander side. By doing this, I can create any meal then add spices later on. You limit yourself and your foods potential by seasoning before you can it. 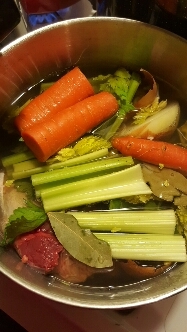 I made a very nutritious beef broth using beef marrow bones that I got for less than $3. I tried this on the stove at first and I wasn’t getting the color I was looking for. I ended up pouring this into a crock pot. Simmer the bones in a pot half filled with water overnight and early morning for over 12 hours in a crock pot. Add onion, garlic, carrot, and celery. Stalks, leaves, skin and all. Everything adds to the flavor and nothing gets wasted. It condenses as it cooks and enhances the flavor. It’s also a great source of energy and protein. I got 6 pints of broth. My 5lb bag of carrots were all washed, peeled, diced into thick chunks so I could keep some crunch in the jar. I raw packed these meaning I didn’t cook them before canning. No one likes mushy carrots! YUK! With veggies, add 1/4 tsp of pickling salt to each jar. I got 13 pints of carrots. I cooked a whole chicken not only for dinner last night, but I wanted to make chicken broth using the carcas. After I cooked my chicken, I added a bay leaf, celery, carrot, and onion stalks, leaves, skin and all. This simmered for almost two hours. I got 6 pints of broth. In the chicken section, they had a good deal on boneless skinless chicken breasts so I picked up a large package and raw packed the chicken. 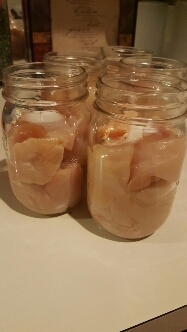 I got 5 pints of cooked chicken which cooked in its own juices during the canning process. For spices, I just love the bulk bins! I pay a fraction of what it would cost to pick up a jar of McCormick. Dill, Basil, Bay Leaves, Granulated Onion, and Rosemary all together cost me less than $3. The second jar is Dill and that was only .30 cents or about half a cup for an example. It was a great Sunday and I had so much fun just by popping on music, coffee in hand, I warmed my kitchen by the oven being on 350, and canned all late afternoon until almost midnight. I tend to shut the world off when I am in the kitchen, but hey….I’m happy and that is all that matters. All of these recipes I pressure canned using 10lbs of weight for 25 minutes. My chicken cooked for 90 minutes. 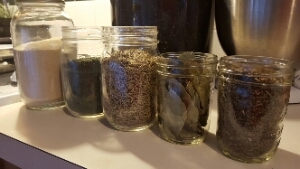 Be sure to visit my Canning page for more basics. Next weekend, I will be canning pinto beans which will be made with bacon and potatoes. Stay Tuned…. I know, I know, any one can make tomato soup and grilled cheese, but this was AWESOME! I used two jars of my homemade canned spaghetti sauce dated 12/25/15 that I had stored in my pantry. -4-5 cups of spaghetti sauce, marinara sauce, or your favorite sauce. Mine is seasoned with Rosemary, Italian Seasoning, Salt, Pepper. 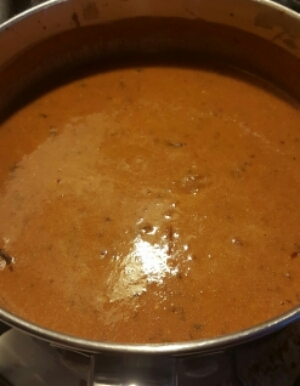 Bring to a simmer and you have very tasty and creamy tomato soup. I dedicate a small cast iron skillet specifically for grilled cheeses. Its big enough for one sandwich if that tells you the size. I do this because the cast iron flavors itself with whatever you cook in it. Mine has a good layer of butter! Add 1 pat of butter to your skillet. Once melted, lay down your bread and add two slices of your favorite cheese. I used Havarti. Before you flip your sandwich keep another pat of butter on standby to crisp the other side. That’s it! 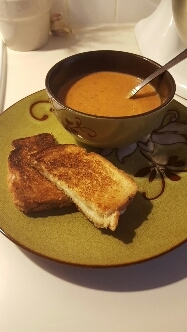 Super crispy buttery grilled cheese and homemade tomato soup. It’s delish!